1 Month Free off second full month on 13+ month leases or $500 off second full month for 10-12 month leases. 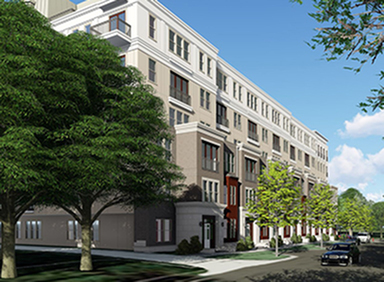 The brand-new apartments at Modera Hall Street perfectly reflect the spirit of this burgeoning neighborhood, offering a collection of 340 homes that are bold, bright and refreshing, like a Deep Ellum IPA on a warm June evening. Here, stunning architectural features meet vintage and organic finishes to create spaces that are as funky as they are and functional. Amenities are top-of-the line from our club-quality fitness studio to the Cave Gaming Lounge to the stunning Sky Lounge with breathtaking views of the Dallas skyline. Two courtyards, an amazing pool deck with tanning ledge, and ‘pet parents’ will love our dog run with lounge, all of which create the perfect atmosphere to mix and mingle. The apartments are bona fide luxe, with particular attention paid to the things that you use every day. The quartz counters, designer fixtures, beautiful lighting and eco-friendly flooring are designed to be easy on the eyes and very nice to the touch. What’s more, we’re a Green Built™ community, so you can live healthy – and energy efficiently. And…exhale. And, back home on Hall Street you’ll enjoy a sublime location adjacent to the Dallas Arts District with easy access to downtown, Deep Ellum and Uptown. Hop on one of our signature Modera cruiser bikes and bike to Cityplace Market or West Village. Or, walk to the Starbucks right across the street, or down to The Nodding Donkey’s sister restaurant Ross & Hall. It’s all right here. What’s more, you can count on our friendly and helpful team to deliver the signature Modera service experience. Here, our goal is simple, yet bold: help you get the apartment you want and making sure you’re happy long after you move in. Cheers to your new apartment at Modera Hall Street! Surrounded by all the best Uptown has to offer. And that's a lot.